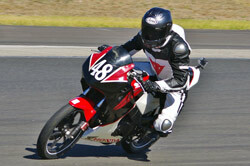 Be like the 2011 Champion Ron Carrick and race in the cheapest, fastest growing class in Motorcycle Racing. 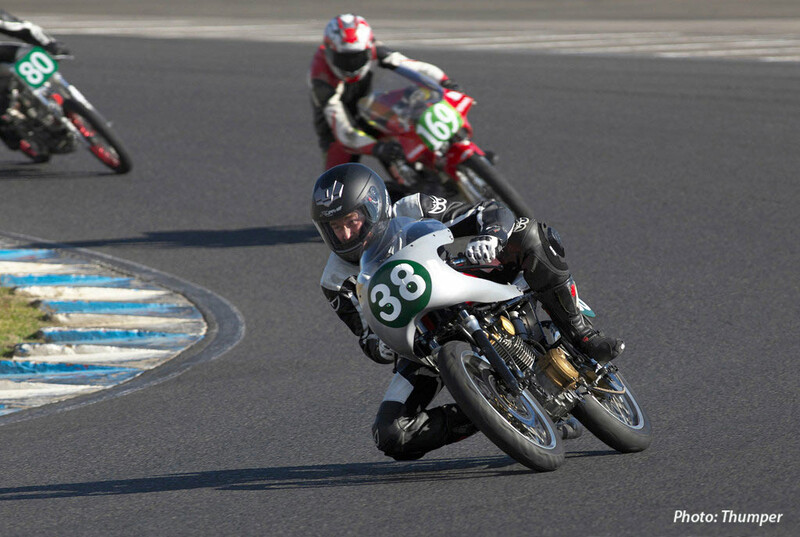 Round five of the Bucket Racing Championship was held at the full GP Gardner circuit at Sydney Motorsport Park. Early morning found the track shrouded in thick fog which didn't lift until after 10am. thus causing the first delay in proceedings. However once the fog had lifted competitors were presented with a pleasant sunny winters day. With the track in good condition a great days racing was promised. The usual suspects were on pole. Tyler Bradford #77 on the blue (BBE CBR150) and #86 Anthony Marsden (Chris Sculley Honda RS85cr) put on a fine display of close racing with never more than a few bike lengths in it in the 3 races. In race one it was just a cats whisker between them as they crossed the finish line. In race 2 and 3 Tyler just edged a few bike lengths to Anthony. Both of them lapped under the 2 minute mark which is pretty impressive for these capacity machines. Down the field there was plenty of dicing with #28 Jack McGauley (Honda RS85cr) #68 Shane Wilcox (Sculley Honda RS85cr), 87 Andrew Bennett and #32 Marty McGauley (Honda CR85) with Andrew Bennett turning the tables on Jack Mc Gauley to finish third in race 3. 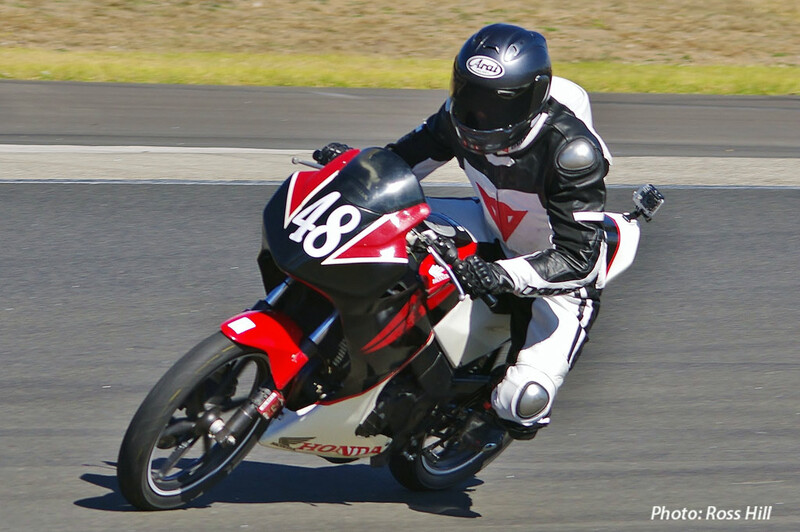 With Number 94 John Olip (Moriwaki 85) retiring in race one and Shane Wilcox in race two it took out two of the front runners. Both retired with mechanical woes. 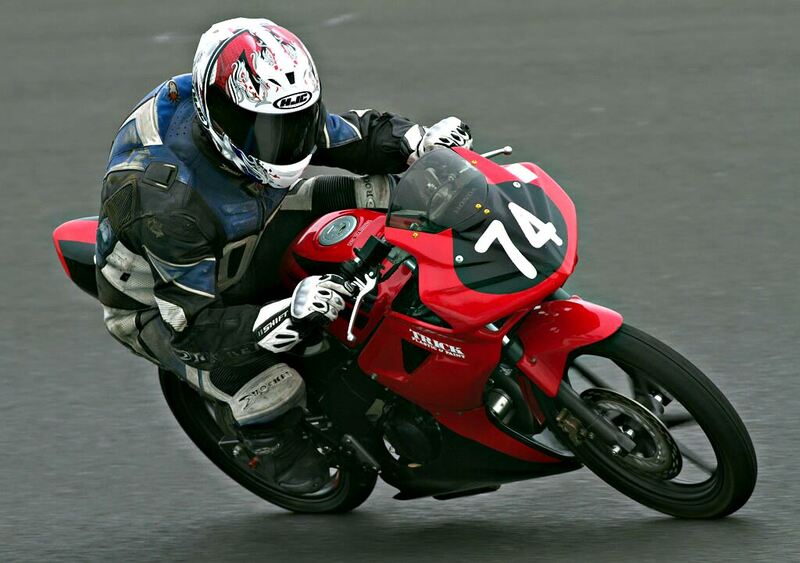 Tyler now has both hand on the Motolite Crown for 2014 as he has a 75 point lead in the Championship. With 3 races (75 points max.) 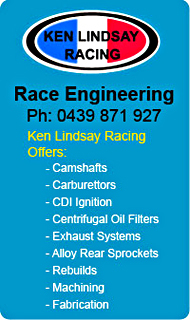 to go in the final round at Wakefield Park Jack McGauley would have to win all three races and Tyler not to score. In a points tie Tyler would win by the number of races he has won. The Superlite PROS as usual put on a fine display of close racing with #38 Junior Murphy (BBE Honda CB150), #169 Ian Gregory (Honda CB150) and #65 Tim Smith (Honda CB150) all taking turns at leading. Drama in race one for Tim Smith discovering his rear tyre was flat as he rolled it off of the stand. Luckily for Tim race ones start was delayed by some 10 minutes while an oil spill on the track was being cleaned up. After a frantic activity in the pits and a visit to the tyre van Tim ended up starting from pit lane. Starting dead last and riding like a man possessed he raced his way to 4th place keeping himself in the hunt for the PRO championship. Races one and two fell to Junior after mighty battles with Ian Gregory but Tim Smith made race 3 all his own with Junior second and Ian 3rd. The Superlite PRO championship has Junior Murphy leading Tim Smith by a handy margin of 34 points with Ian Gregory a further 17points back and Ken Lindsay a mere 4 Points off of Ian. Final round coming up, 75 points to play for, anyone's Championship. No stopping #8 Kurt Wagus (BBE Honda CB150), Hard as the ever improving #81 Robert Tisdell (Honda CB150) tried he could not catch the flying Kurt in any of the races although he had reduced the winning margin to under one second by the last race. 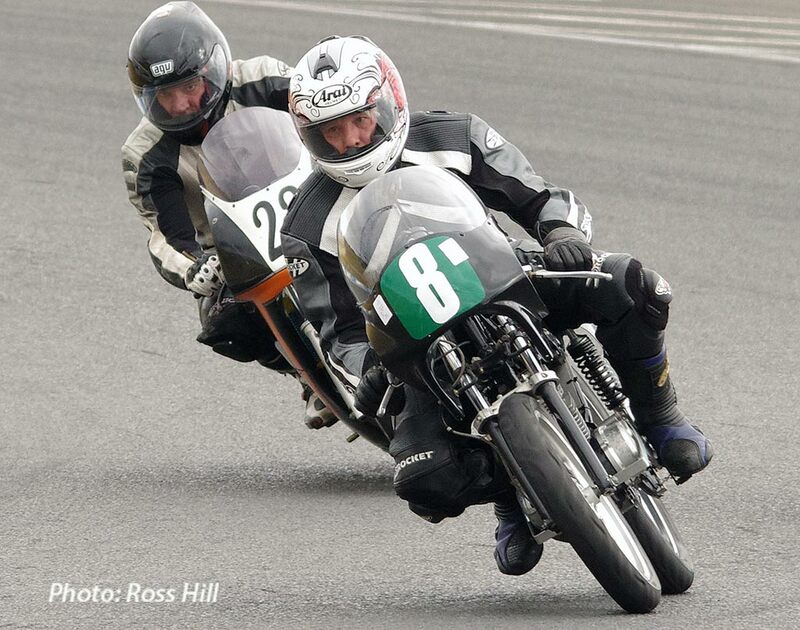 #62 Jim Murphy (BBE Honda CB150) came home 3rd in all races getting close attention from the flamboyant #181 Glenn Tisdell on his Suzuki150. By finishing 5th #31 Duncan Taylor (Kawasaki KH100) keeps a 1 point advantage for 3rd place in the championship over the on form Kurt Wagus. 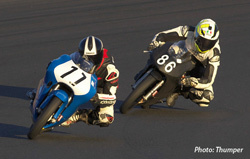 Next up #99 Anthony Bilston (Suzuki GS125) and #164 Darrell Francis(Honda CB150). The Superlite AM Championship is very close with Jim Murphy having an 11 point lead over Robert Tisdell who in recent races has consistently outpaced the green machine rider gradually reducing the points gap. Duncan Taylor on the lone Kawasaki lies 3rd by 1 point over Kurt Wagus. As before 3 races to go, 75 points available it could all change on the final day. Nicolas Wenban Honda CBR125 was unbeatable on the day winning the three races comfortably. 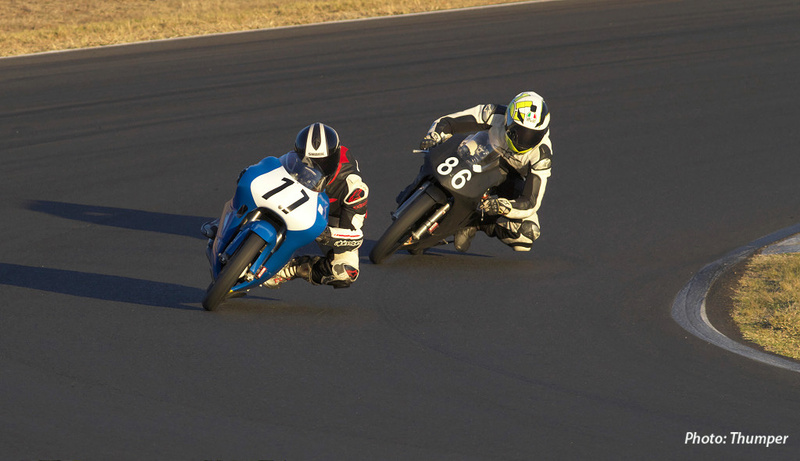 Race one saw #79 Stephen Kairl (Honda CBR125) keeping Nicolas honest for a few laps but the 79 bike slowed and #888 Jack Robinson (CBR125) who had started a long way back slipped into 2nd on the last lap. Ron Pulido the championship leader came next. 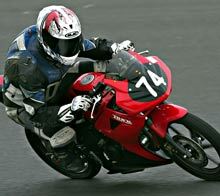 Jack Robinson dented his championship hopes by retiring in race two but bounced back to finish 4th. in race three. 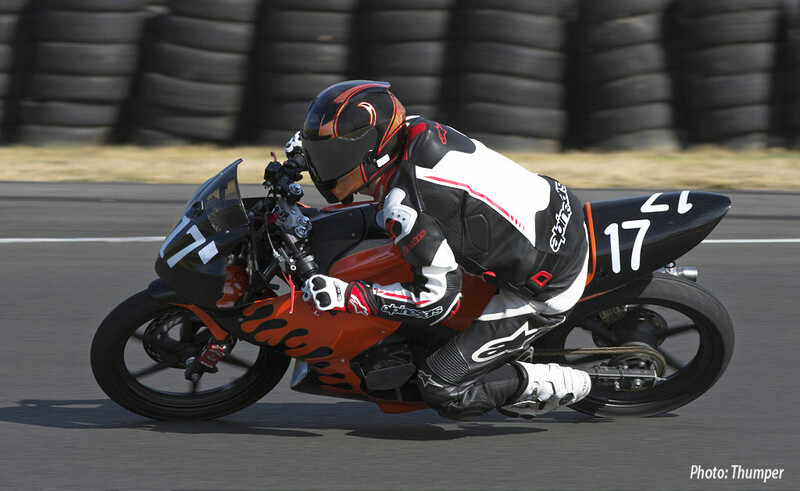 The podium positions for races two and three were Nicolas Wenban, Ron Pulido and Ryan Young having a one off ride aboard his Dads KTM125. Number 67 Richard Draper (CBR125) and #16 Robert Young (CBR125) came home next. The Commuterlite PRO championship will go down to the wire at the final round at Wakefield Park. Ron Pulido holds a 20 point margin over Nicolas Wenban with Jack Robinson another 10 points down. Adam Cameron was untouchable on the day winning the 3 races in Commuterlite AM. The other placings were fiercely fought over and were in doubt until the chequered flag came down. Andrew Martin and Oliver Higgins damaged their championship hopes with Andrew retiring in race one and Oliver nursing some problems finishing off the podium..
Ron Wenban finished 2nd in Race one with Richard Cook 3rd. 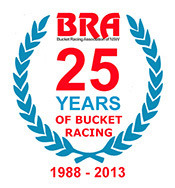 In race two the positions were reversed and in race three Ron was 3rd. with Andrew Martin salvaging a healthy points score with 2nd. place. Despite the racing in this class being close and exciting the Commuterlite AM championship points scores have pretty big margins between the contestants. A lot of the newer riders have been stand outs in this contest, like championship rivals Adam Cameron, Andrew Martin, Oliver Higgins, Richard Cook and not forgetting Ron Wenban who can still show these younger riders a thing or two. Adam has a 41 point lead over Oliver Higgins who in turn has a 37 point lead over Andrew Martin with Ron Wenban a further 10 points back. 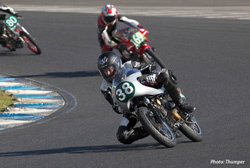 Racing motorcycles is never predictable so all could change at the final round at Wakefield Park.